Ginger is a wonderful herb for winter; not only is it deliciously warming, but it has an amazing complement of health benefits, including being a potent antibacterial agent and a strong anti inflammatory, both wonderful things for treating and preventing coughs and colds. Combining the ginger with honey helps it last longer, and also adds the incredible properties of honey as well. I highly recommend using local raw honey if possible, but if you can't get any, then any good honey will do. I make my Hot Ginger Tea Syrup in the Thermomix, but you could easily make it on the stove top, with just a bit more time involved. This recipe makes a big batch, but you could halve or quarter it if you don't see yourself drinking it every day! 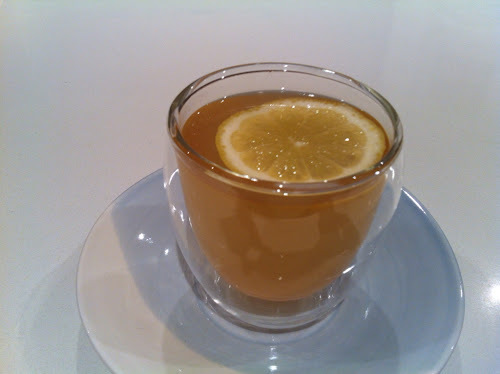 To serve, I pour about 1cm into the bottom of a cup, then top with boiling water and a slice of lemon. It is also great with the juice of 1/2 - 1 lemon added (especially if you can feel something coming on or are already sick), or as an iced "tea" made up with chilled sparkling water.